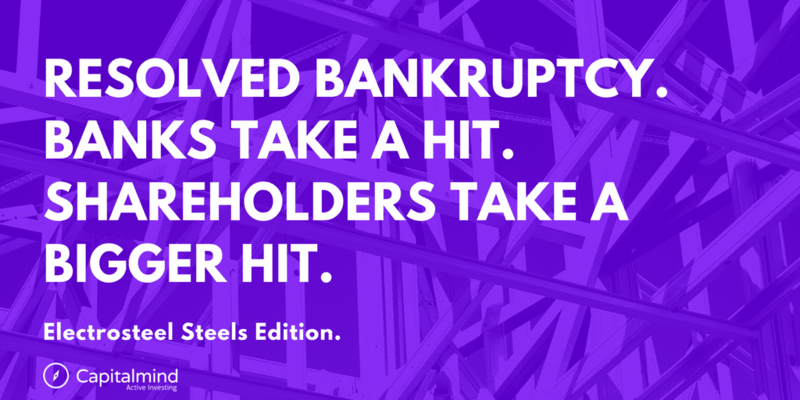 The lenders of Electrosteel will get some part (but not all) of the debt returned to them. But what happens to existing shareholders? The resolution plan for Electrosteel Steels has demonstrated how bad it really could get. The full plan isn’t known yet, so we’ll have to still make some educated guesses. But here’s the statement from Vedanta. 1) Vedanta puts in Rs. 1800 cr. as equity for 90% of the company. 2) Vedanta also puts in Rs. 3515 cr. 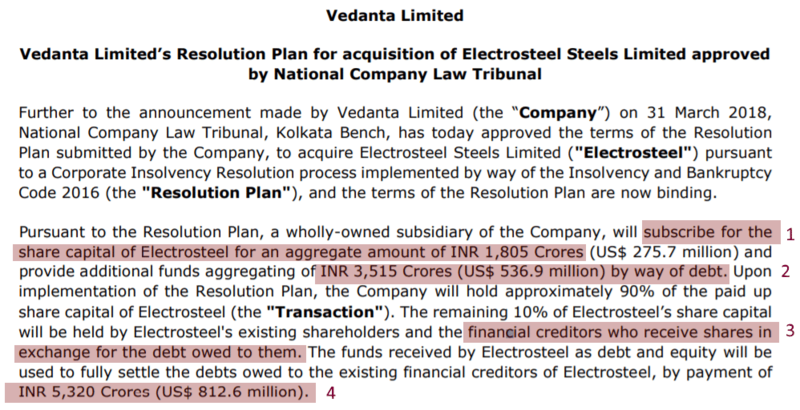 as debt, so electrosteel will now owe Vedanta debt of Rs. 3515 cr. 3) Lenders who currently are owed money, a sum of Rs. 13,000 cr. will take a “haircut” – meaning they agree to take much lesser back (point 4 below). The hair cut amount will be converted to equity shares. 4) Lenders get paid Rs. 5320 cr. as whatever they are owed. Here’s the order confirming the resolution. So, How Does It Impact Shareholders? Essentially, Electrosteel Steels is getting a valuation of around Rs. 0.08 (8 paise) per share today, after lenders are issued shares for their hair cut, and then Vedanta is issued new shares. Even after it gets into fantastic production metrics, it’s probably worth less than Rs. 0.25 per share. Forget all this, Should We Buy? If you forget all this, you can forget buying also. It’s really not worth the effort if the valuation metric even in the most bullish case (see video) is just Rs. 0.25. Even if you give zero shares to lenders, the valuation after the company has recovered and started to make profit, is just Rs. 2.5 per share. There’s simply no visible value here. Investing is easy, once you get through the hard parts. Banks will probably need to take a bit more of a hit on their profits. Of the Rs. 13,000 cr. in debt, they get back just Rs. 5320 cr. The rest will be written off. That’s a Rs. 7680 cr. hit. Of the 13,000 cr. the banks would have provisioned 6500 cr. already, due to RBI rules stating that if an account goes to bankruptcy, banks have to take a 50% provision. But now, they’ll have an additional Rs. 1300+ cr. as a further hit to be taken. In the coming quarter. Vedanta’s investment of Rs. 1800 cr. might be worth more if the company gets back into the black. At a 5000 cr. valuation their 90% is worth Rs. 4500 cr. and that is not a bad return on investment, even if it takes three to five years. Of course, there’s a risk, but a reward of 25% a year is quite worth it. Plus, Vedanta has iron ore mines nearby and can add value in terms of ensuring supply. But this is so tiny in terms of Vedanta’s total business that it makes little sense to use it as a reason to buy Vedanta shares. It will take a few more such deals for the impact to be of significance. But hey, at least someone’s winning. Disclosure: No positions. We have no recommendations or ownership of Electrosteel steels, and we have no connection to any of the companies mentioned. This is purely for educational purposes; please do not make any transactions on the basis of this article. Do your own research.